Mama no I well in Kameiin Temple was described in Manyoshu (Myriad Leaves) that Tekona the beauty in the legend drew water from. According to an old local guide book 'Katsushika Shiryaku', the water in the well was very clear and cold, and it had never dried up. 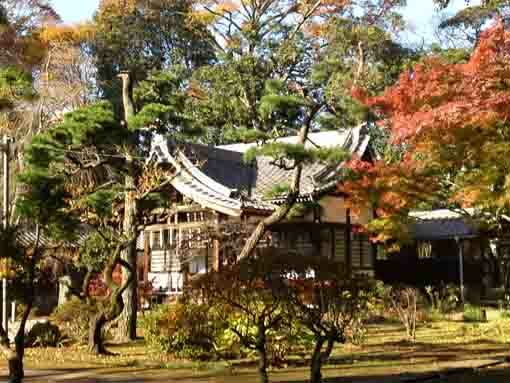 Moreover Kameiin Temple is famous for where Hakushu Kitahara, a famous poet once lived in. Now there is a stone tablet scribed his tanka poem on in the temple. Mushimaro Takahashi a poet in Manyoshu (Myriad Leaves) wrote a tanka poem when he heard the legend Tekona had drawn water from Mama no I well. 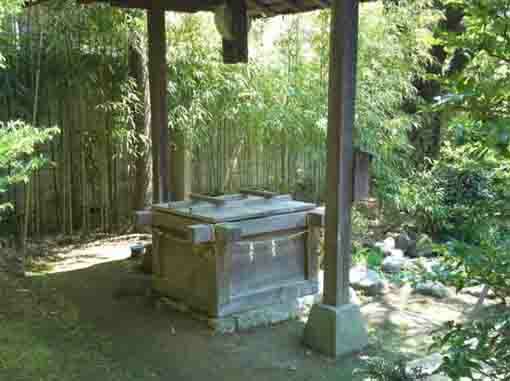 The well he had described could be the well in Kameiin Temple. 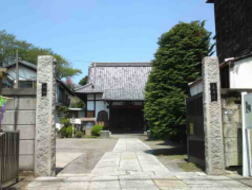 Kameiin Temple was built by the 11th abbot the venerable Nichiryu of Mamasan Guhoji Temple in 1635 to be a place for him to stay after his retirement, then it was called Kameibo Temple. 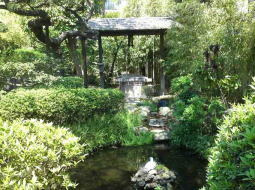 The reason for naming Kamei was that there was a spring like a vase with much water in the site of the temple. Spring in 1696, Nagayori Shzuki, a faithful supporter of Mamasan Guhoji Temple, reconstructed Kameibo Temple to bury his father Tsunenaga respectfully, after that Kameibo Temple was called Reibokuin Temple named after Suzuki's. Besides Nagayori and the 17th abbot of Mamasan Guhoji Temple built three stone tablets on the histrical spots, 'Mama no I well', 'Tekona's tomb' and 'Mama no Tsugihashi', and to save their legends forever. 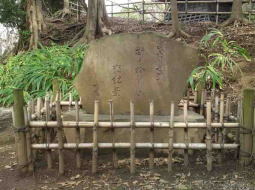 After Nagayori had passed, the fortune of Suzuki family went into decline and a sacred turtle appeared at the well, the name of the temple changed to Kameiin (the well of the turtle) Temple. Anyway Hakushu Kitahara, a famous poet early 20th century in Japan, lived in Kamaiin Temple for a half and a month in May of 1916. It was his worst year in his life. This tanka poem shows his bad year. He described Mama no I well then. Hakushu Kitahara moved to Koiwa on the other side of Edogawa river, and he stayed in a small hat called Shiensoja along the river. Moreover, Komyohoji Nyudo Sessho (Michiie Kujo) wrote Mama no I in his tanka poem and it is in Gyokuyoshu. Hakushu Kitahara wrote in 'Mama no kankyo no ki' (a diary of the secluded life in Mama) the preface of 'Katsushika Kanginshu', 'My wife and I got a temporary residence at Kameibo Temple next to Tekonareishindo Shrine in Mama'. 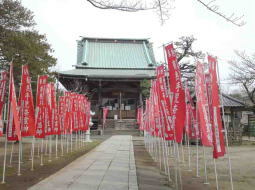 There is a stone tablet scribed his tanka poem in the temple. 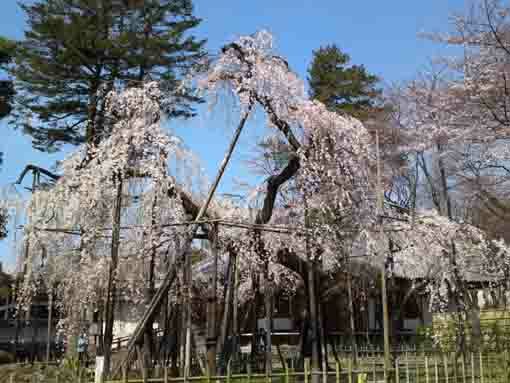 Shienshosha, Hakushu's residence in Koiwa, was moved to and has been preserved in Satomi park in Ichikawa city now. Hakushu Kitahara was a poet, a tanka poet and a writer of children's songs. His real name was Ryukichi Kitahara. Hakushu started to contribute some tanka poems to a tanka magazine 'Bunko', and he went to Tokyo to enter the school of English literature at Waseda University in 1904 but he dropped out it. Hakushu became a disciple of Tekkan Yosano in 1906 and attended to found 'Shinshisha' and published his works on a magazine 'Meisei'. From next year, he traveled on his hometown Yanagawa, Nagasaki and Amakusa, then he organized 'Pan no Kai (a group of bread) that would became the base of the esthetic school of literature with Mokutaro Kinoshita, Isamu Yoshii and so forth. He published a literary magazine 'Subaru' with Ogai Mori, Takuboku Ishikawa, Mokutaro, Isamu and so forth and he published a poetic works 'Jashumon' in 1909. Then he published 'Omohide' that described the sights seeing in his hometown in his childhood, 'Tokyo Keibutsushi oyobi sonota' that described exciting views in urban areas in Tokyo, and a tanka poetic works 'Kiri no Hana'. Later he wrote several masterpieces of children's songs and folk songs, so he wrote great masterpieces on the new folk songs such as 'Chakkirbush' and 'Matsushima Ondo'. 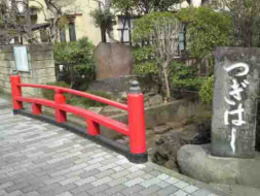 He was the great poet remaining many poems, tanka poems and folk songs even now in Japan. He appointed the member of the Japan Art Academy in 1941. 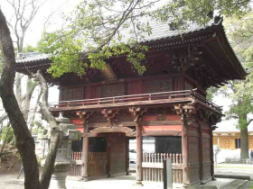 Kameiin Temple and Mama no I well have great accessibilities from both Narita and Haneda International Airport. From Narita International Airport, take Keisei-line and get off Ichikawamama Sta or Konodai Sta, take minimally 45 minutes from Narita Airport. And also take JR Sobu-express line, transfer the line at Funabashi to Keisei-line, get off Ichikawamama Sta or Konodai Sta. From Haneda International Airport, take Keikyu-line bound to Narita, and get off Ichikawamama Sta or Konodai Sta. Take 10 minute walk from both Ichikawamama Sta or Konodai Sta.